The following open letter addressed to officials and officers in the Beijing Public Security Bureau was written by former CMP fellow Zhai Minglei (翟明磊), a veteran journalist who has been an active independent writer and NGO activist since leaving Guangzhou’s Southern Weekly more than a decade ago. 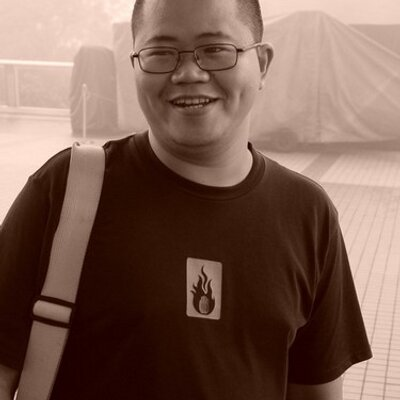 The letter, posted yesterday to the website of the New Citizen’s Movement, addresses the recent formal arrest of activist Guo Yushan (郭玉闪), and the sustained crackdown on intellectuals and activists in China. Zhai Minglei, pictured in 2003 on a visit to the University of Hong Kong. I address you in this way not with the intention of slighting you. I hope only to underscore the fact that you are not independent public servants in any modern sense, but obey the will of particular leaders. However we might view things, you and I do not share a common tongue. You round up intellectuals in Beijing, lacking any restraint whatsoever. You shut my friend Guo Yushan (郭玉闪) away in a detention center. You shutter away Kou Yanding (寇延丁), so that even now her whereabouts remain unknown. Xia Lin (夏霖), [Guo Yushan’s former defense lawyer], has likewise been criminally detained. Need we speak of He Zhengjun (何正军), [a young NGO activist], or Huang Kaiping (黄凯平), [the founder of a think tank called the Transition Institute]? What a carnival it has been these months, a regular old-style purge (瓜蔓抄). But I should explain, perhaps, what I mean an “old-style purge.” When the Hongwu emperor Zhu Yuanzhang (朱元璋), the first emperor of the Ming Dynasty, and his son, the third Ming emperor Zhu Di (朱棣), pursued cases against those they suspected of treason, they began with the principal culprit and blazed their way down the list, from his colleagues to his classmates, from his clan members to his neighbors. A chain of gruesome tyranny. So you go down your list until you reach Xu Xiao (徐晓), a well-known female editor who has no quarrel with the world, who makes no fuss about politics. Next, you get your paws on Xue Ye (薛野), a recognized publisher active in doing charity work. Then comes Liu Jianshu (柳建树), the chief executive officer of Liren University (立人大学), a non-governmental organization. You roil up an atmosphere of terror, driving many public intellectuals in Beijing away from the capital. Under the clear ken of heaven, you leave a trail of broken homes and jobless workers. So dark is the fear now that even in the daylight people must raise their lanterns. We live, or so it certainly seems, through days absent the merest rays of justice. Try reading this chronicle of violence against the minutes from the Beijing Forum on Literature and Art (北京文艺座谈会) and the contrast between candied rhetoric and bitter deed truly astounds. All of these deeds leave the intellectual world, the legal world, the charity world, the world of conscience, the hearts of ordinary people, with an abiding sense of mourning. The work much of you do is in actual fact a blight on the Party and the government. Rightness and wickedness, like ice and fire, cannot find common ground. Therefore, I have no real hope or expectation of true dialogue with you. But I find this recent slogan, “ruling the nation in accord with the law” (依法治国), so pleasant to the ear. The phrase awakes in me such a hopeful spirit of naivete. And having said that, perhaps our only common tongue is the notion of the law. So I’ll dispense with the other nonsense and try debating you on matters of the law. In the midst of the jasmine revolution, I said to police here in Shanghai: There is no political movement in history that has not in due time been turned on its head. So, I said, abiding by the law protects not just me, but you as well. Before long, the tables turn. And lo and behold, the top cop who called the shots so viciously during that police campaign, Zhou Yongkang (周永康), has now become a national demon, a traitor to the people. What should one do? I wonder if you realize, as you go about enforcing the law, that you might serve as policemen for life, as leaders come and go. According to international human rights law, carrying out the illegal orders of one’s superior does not constitute a viable defense against criminal responsibility. In the future, then, it might be you standing before the court. Perhaps you believe no one has the power to prevent your gangster-like conduct. But the storm cannot last. Beijing will return to peace and reason. When that day comes you will be faced with the shame of what you have done. My chief purpose in writing this letter is to show that there are still Chinese who do not fear the prison cell, who dare to face up against the mass of terror. Behind us stand legions of supporters. They pass along our calls. They raise funds in support. They hearten us with messages of encouragement. In tested times, a scholar can die for a friend. Guo Yushan is a dear friend. And just as Yushan braved death to rescue [Chen] Guangcheng (陈光诚), how could fear stop my hand in coming to the aid of such a friend? I am willing to pay the price. Let us see if there is any true justice in this world of ours. Friends have advised me against resisting in this Nazi age of ours. I don’t believe this is a Nazi age. Unlike Nazis, the evil forces working among you have no true convictions. They have only interests, and interests do not make fast friends. We citizens do have convictions. Those convictions unite us, and they will continue to do so. You — by which I mean the wicked forces among you, and not all police — wield your power for only a time before it vanishes under the waves of history. You want to lock every intellectual of conscience behind bars, to bury them alive. You don’t realize we are only seeds. Your actions will not destroy us, but will only toughen our resolve. In any age, principled struggle is meaningful. When the conscience of the people points the way, wickedness will be put in its place. The chief weapon of the citizen is the law, a weapon that is legitimate and reasonable and must be used. If we do not use the law, it becomes little more than scrap paper. I will take up the law in this struggle, and I will pay whatever price.